Last week, news broke that Stargate SG-1 actress Teryl Rothery would be guest starring for a multi-episode arc on Arrow… but little was known about who she would be playing. Here at GreenArrowTV, we’ve got you covered, not only revealing who she will be playing, but also that there’s something very cool about her character: She’s playing a character from the DC Universe who first appeared in the comics over 50 years ago! In addition to Stargate and Cedar Cove, the very busy Rothery recently appeared on The CW’s Cult. This is also not her first stop in the DC Universe as she appeared in the Smallville episodes “Talisman” and “Requiem” as different characters. 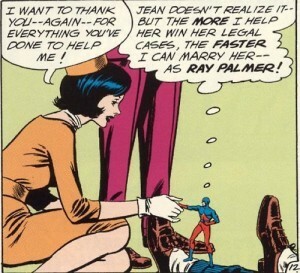 The appearance of “Jean Loring” here might imply that the “Ray and Jean” that Laurel referenced in “The Undertaking” is a not a reference to Ray Palmer and Jean Loring after all… or, maybe she was saying “Ray and Gene” for all we know. Look for her to make her first appearance on the show in the third episode of Arrow Season 2.